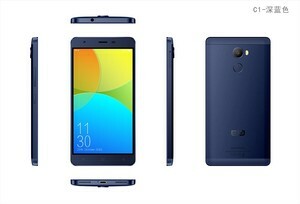 Enterprising Chinese smartphone maker Elephone is at work on a new model, it seems. Two photos of a purported Elephone C1 have leaked online, showing a metal smartphone with a sturdy look and a fingerprint scanner on the back panel. The handset is shown in Blue and Gold colors. There's no home key, although three capacitive touch keys are present below the display. A single camera lens of considerable size is positioned above the fingerprint scanner, and to the right to it, there seems to be a pair of LEDs for flash photography. Reportedly, the Elephone C1 features a 5.5-inch 1080p resolution screen and runs a version of Android 6.0 Marshmallow. At present, the manufacturer is gearing up to launch two new models, the Elephone S7 and Elephone R9. Both are scheduled to go up for pre-sale later this month. The S7, in particular, gained a bit of notoriety for copying the appearance of the Galaxy S7. But we all know Chinese manufacturers are shameless like that. If they can get away with copying Samsung, then more power to them, we guess. Anyway, Elephone will probably announce the C1 pretty soon, and we'll have more information on this fine-looking handset to share. Stay tuned!